If you're driving an older model Ford Windstar minivan you may need to get that car back to the dealer, pronto. Ford is issued a recall, warning that corrosion could contribute to the rear axle cracking and could potentially cause an accident. "An axle breaking is a very serious defect," said Clarence Ditlow, executive director of the Center for Auto Safety, a group formed by Ralph Nader and Consumers Union. He called the recall "long overdue" and suggested it should be in all states. 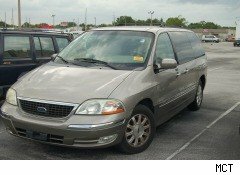 The recall impacts nearly 575,000 Ford Windstar models for model years 1998 through 2003 and produced from September 1997 through February 2003. Ford said the recall is for Windstars currently registered or originally sold in Connecticut, Delaware, the District of Columbia, Illinois, Indiana, Iowa, Kentucky, Maine, Maryland, Massachusetts, Michigan, Minnesota, Missouri, New Hampshire, New Jersey, New York, Ohio, Pennsylvania, Rhode Island, Vermont, West Virginia, and Wisconsin. Ford told the government that corrosion over time can weaken the axle and, when combined with stress, can lead to the axle breaking. A Ford spokesman said the company had received a small number of reports of fractures that "affected vehicle handling." "Corrosion and stress can lead to cracks, which if undetected can propagate and result in a complete fracture of the axle. Consequence: a fractured axle can affect vehicle handling and increase the risk of a crash," said the recall. The states were chosen because they are ones where corrosion is quite common, said the Ford spokesman. Ford also warned, "A completely fractured rear axle may lead to loss of vehicle control. There may be little or no warning to the operator before a cracked rear axle completely fractures." Ford said that if warranted, it will install rear axle reinforcement brackets. The National Highway Traffic Safety Administration opened a formal investigation into the defects in May, but the recall is voluntary. Ford will begin mailing letters to owners on Sept. 27. For more information, call 1-866-436-7332 x4. Ditlow said his group has been getting reports of axles breaking on the Windstar since 2008. One woman wrote that the only reason she and her husband managed to avoid a major accident was because "my husband forgot to take the expressway." Ditlow questioned Ford's decision to confine the recall to the Northeast and Midwest region, saying the same cars were sold all over the country. "What it does is ignore that vehicles and people travel. The car sold in Florida may go to Michigan," he said.